Give generously today to provide scholarships to families in our community. 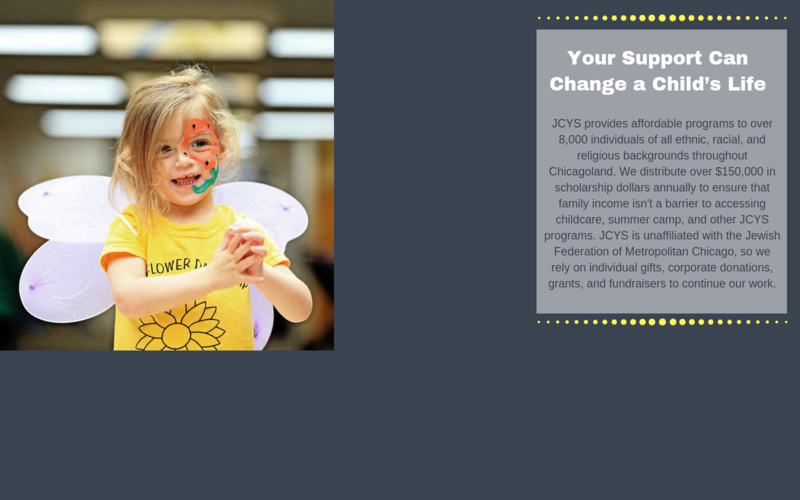 JCYS provides affordable programs to over 8,000 individuals of all ethnic, racial, and religious backgrounds throughout Chicagoland. We distribute over $150,000 in scholarship dollars annually to ensure that family income isn't a barrier to accessing childcare, summer camp, and other JCYS programs. JCYS is unaffiliated with the Jewish Federation of Metropolitan Chicago, so we rely on individual gifts, corporate donations, grants, and fundraisers to continue our work. To learn more about giving opportunities, contact Samantha Stankowicz, Director of Development, at (312) 726-8891, ext. 122 or sstankowicz@jcys.org. In honor and memory of my dear friend Gordon Haworth in support of the Family Center Lincoln Square Ravenswood Area. In memory of an incredible man - he will be missed. Sending love to the Haworth family. We are giving in honor of Gordon Haworth, a wonderful man, who we had the pleasure of knowing.